Everyone is coming up with their own ways to celebrate Batman’s 80th anniversary. 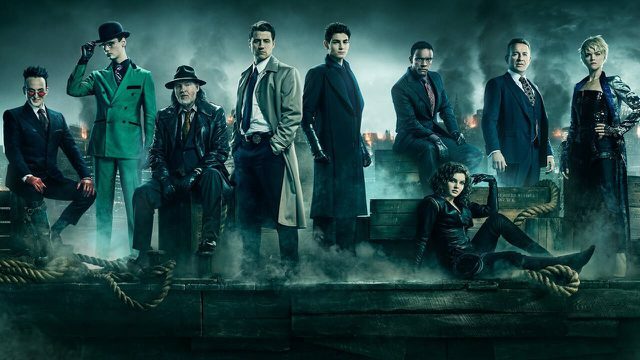 Now, Gotham is getting in on the festivities with a new promo for its upcoming series finale. We’ve known for a while that the show’s last episode will feature Bruce Wayne dressed in his iconic costume. Thanks to this latest image, we have a (slightly) better idea of what the suit’s cowl will look like. You can check out the teaser via the series’ official Twitter account below. Gotham’s final hour will jump forward 10 years and show Bruce fully embracing his alternate persona as the city’s Dark Knight. Apparently, David Mazouz will be sharing the role of his character’s future self with another actor. Viewers will hear Mazouz’s voice and see his face during close-ups, while a taller performer will be used for wide shots. Showrunner John Stephens previously explained how Gotham will handle Batman’s onscreen reveal at the show’s TCA panel last month. Obviously, the image doesn’t tell us much and could just as easily be a still from any one of the character’s other film or TV appearances. But hopefully, the producers won’t share more than this in order to preserve the surprise factor until the episode finally airs. Gotham will conclude its five-year run on April 25. What do you think of this latest teaser image? Give us your impressions in the comment section below!